Dr Leaf has been promoting her food philosophy lately, but yesterday and today, she has come back to one of her favourite neuroscience topics. Dr Caroline Leaf is a communication pathologist and a self-titled cognitive neuroscientist. 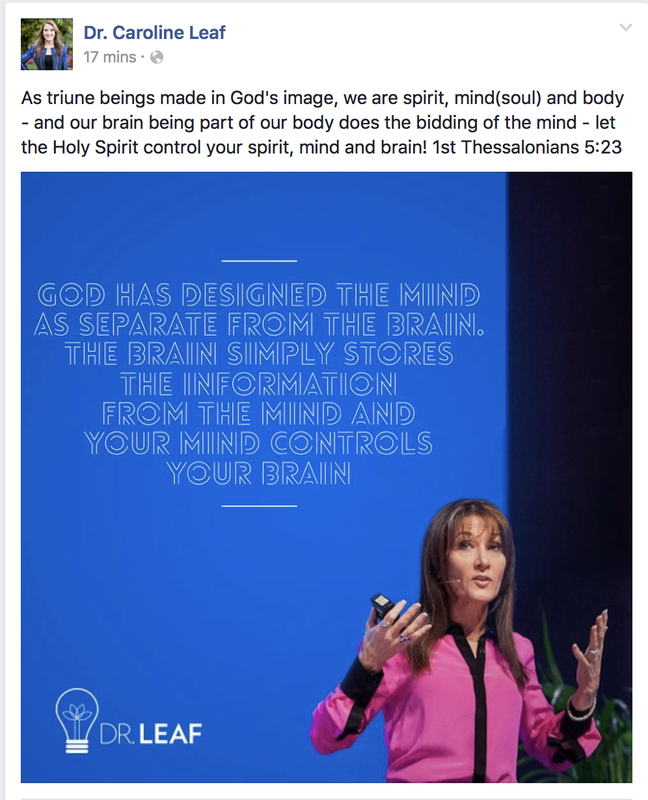 It’s her belief that “as triune beings made in God’s image, we are spirit, mind(soul) and body – and our brain being part of the body does the bidding of the mind …”. On what basis does she make such a claim? I’ve reviewed the scripture relating to the triune being hypothesis. The Bible doesn’t say that our mind is seperate to our brain, nor that it dominates and controls our brain. Dr Leaf’s statement yesterday is simply assumption based on more assumption. It’s like an intellectual house of cards. The slightest puff of scrutiny and the whole thing comes crashing down on itself. To try and reinforce her message today, Dr Leaf quoted Dr Jeffrey Schwartz, psychiatrist and neuroscientist, “The mind has the ability to causally affect and change pathways in the brain.” Jeffrey M. Schwartz is an OCD researcher from the UCLA School of Medicine. It appears he lets his Buddhist anti-materialism philosophy cloud his scientific judgement. Well Dr Leaf, I see your expert and I raise you. Dr David Eagleman is an author and neuroscientist at Baylor College of Medicine in Texas. He has written more than 100 scientific papers on neuroscience, and has published numerous best-selling non-fiction books including ‘Incognito, The Secret Lives of the Brain’ which was a New York Times best-seller. He isn’t an irrational anti-materialist. This statement makes much more logical sense. The functions of the mind are all vulnerable to changes in the brain. Take medications as one particular example. Caffeine makes us more alert, alcohol makes us sleepy or disinhibited. Marijuana makes it’s users relaxed and hungry, and sometimes paranoid. Pathological gambling, hypersexuality, and compulsive shopping together sound like a party weekend in Las Vegas, but they’re all side effects linked with Dopamine Agonist Drugs, which are used to treat Parkinson’s disease. There are many other examples of many other physical and chemical changes in the brain that affect the mind. Conversely, there is limited evidence of the effect of the mind on the brain. Sure, there is some evidence of experienced meditators who have larger areas in their brain dedicated to what they meditate on, but the same effect has been shown in other parts of the brain unrelated to our conscious awareness. But since the mind is a function of the brain, whatever effect the ‘mind’ has on the brain is, in reality, just the brain effecting itself. So Dr Leaf can cherry-pick from her favourite authors all she wants, but quoting a supportive neuroscientist doesn’t diminish the crushing weight of scientific evidence which opposes her philosophical assumptions. If she wants to continue to proffer such statements, she would be better served to come up with some actual evidence, not just biased opinion. Selye said that, “Everybody knows what stress is, but no one really knows.”  Hans Selye is considered the father of modern stress research. He was one of the first scientists to conceptualise and measure this ethereal force. The General Adaptation model was groundbreaking, and the sheer volume of work done by Selye brought his theories to the forefront of the scientific community. With time, the theory slowly descended from its place of adulation as other evidence came to light , but it has remained foundational, and Selye is still revered as the father of modern stress research. The term stress “generally refers to experiences that cause feelings of anxiety and frustration because they push us beyond our ability to successfully cope.”  Scientifically, stress has been difficult to define. Different researchers often use different definitions of stress depending on what they’re studying or what field of psychology or science they belong to . I wanted to look at stress from a different perspective. In the next series of posts, I want to look at the basic concepts of stress and its functions in nature. I will spend some time looking at different ways of conceptualising stress, and look at how they offer is life lessons on how to approach our stress. I’ll then have a look at what it is that helps us cope with stress. To gain a better understanding of stress, it’s useful to step away from the medical concept of stress, and think about what the term means in other fields. So the mechanical definition of stress is, “pressure or tension exerted on a material object.”  There are a few illustrations of mechanical stress, in our bodies and in everyday life, that are good metaphors for stress in our lives. I confess I am NOT a musician. I’ve never learnt to read music or play an instrument. But I do know that when you first put a new string on the guitar, it’s unstretched – there is literally no force on it at all. If all you did was tied the two ends of the string to the tone peg and the tuning peg, the string would remain limp and lifeless. It wouldn’t be able to do anything useful. It certainly wouldn’t play a note. When the tuning peg is twisted a few times, there is some tightness in the wire. The string is now under tension (i.e. stress). It is now able to play a note of some form, so it can do some work and fulfill some of the function of a guitar string. But the pitch isn’t good enough – the note is out of tune. With a small adjustment, the string reaches its optimal tension and can play the correct note! This is the point where the string is fulfilling its designed purpose. Optimal stress equals optimal function. With further tightening of the string, the perfect pitch is lost, but the string can still produce a sound of some form. With more tension, the string can still make a noise, but it sounds awful, and the fibres inside the cord are starting to tear. If the string were wound further and further, it would eventually break. If this ratio of the tension of the string versus the usefulness of the string were to be plotted as a graph, it would look like an upside down “U”. 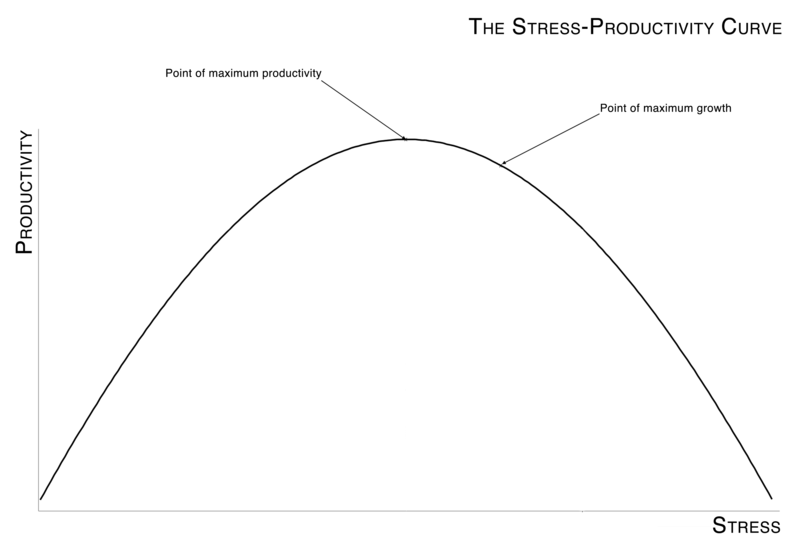 This is the classic stress/productivity curve. The second metaphor that I think illustrates a different concept of the stress/productivity relationship is a car. As well not being a musician, I am also NOT a mechanic! I know the important things like where the petrol goes, and how to drive them, but otherwise cars are very mysterious and powerful devices, their mystery is only exceeded by their power. What I do know is that the engine is very much like the guitar string. As more petrol is fed into the engine, the engine gets more powerful. Soon, the engine finds its “power band”, a zone of maximum torque that can be achieved at moderate revolutions. As the engine is given more gas, the power output declines from the middle of the power band. If the engine was maxed out then the amount of functional power coming out is reduced. This would plot as a similar graph to the U-curve of the stress/productivity curve. But cars not only have engines, but also a gearbox. The gears allow for multiplication of the work done (the productivity) for the same stress on the engine. As a child, I didn’t dream of becoming an astronaut, but I was interested in space. The beauty of our night sky is as stunning as any forest, river or mountain. I would read of the astronauts in rockets and in space stations, floating around in zero gravity, swimming through the “air”. That sounded like a lot of fun. But zero gravity isn’t particularly good for you. Some early astronauts had to be carried off their landing craft on stretchers because the effect of zero gravity would render these men weak and atrophied. They boarded the spacecraft at the peak of their physical strength and fitness, but after only a few weeks without gravity, their bodies resembled that of the elderly (although without the wrinkles) . It’s a general principle of the human body that any tissue that isn’t needed shrinks in size – a process called atrophy. In zero gravity, the body doesn’t need as much muscle, so the muscles shrink. The body doesn’t need as much bone strength, so the bones weaken. There is no gravity to pull their blood away from their head, so the blood volume decreases. Because there is less muscle to pump blood to, and less blood to pump, the heart doesn’t work as hard, so the heart muscle atrophies. The net effect of zero gravity is to make you physically weak . On the other hand, too much gravity is not great either. Animals can adapt to small amounts of hypergravity . But large amounts aren’t so good. During astronaut training, NASA subjects the rookie spacemen to rigorous tests including placing them in a large centrifuge and spinning it very fast. The result is an increase in the gravitational forces applied to their bodies. The increased gravity makes everything in the body heavier and their blood is pulled towards the legs and away from the brain, which leads to what is known as G-LOC (Gravity-induced Loss Of Consciousness). In other words, the heart can’t fight the increased force of gravity and the brain loses its blood supply, which makes you pass out. Josh McHugh did an entertaining piece on his experience with G-LOC and the centrifuge in Wired (2003) . In this sense, gravity is to us physically like stress is to us mentally. Without gravity, our physical bodies turn to mush as we slowly weaken from the inside. Too much gravity, and our physical bodies are slowly squashed by the invisible weight of the extra G’s. Our bodies work best at 1G. In the next post in this series, I’ll look at how these different models of stress apply to our everyday. What Is Stress. [cited 2013, July]; Available from: http://www.stress.org/what-is-stress/. Oxford Dictionary of English – 3rd Edition, 2010, Oxford University Press: Oxford, UK. Gravity Hurts (So Good). NASA Science | Science News 2001 [cited July 2013]; Available from: http://science1.nasa.gov/science-news/science-at-nasa/2001/ast02aug_1/. In every day life, if someone started talking in strings of indecipherable, chaotic syllables, you’d be giving them quite a lot of space, concerned about how much methamphetamine they’d been using. In the average charismatic church, it’s just another service (the speaking in tongues, not the meth). In scientific terms, speaking in tongues is referred to as “Glossolalia”, from the Greek, ‘glosso-‘ ~ ‘the tongue’ and ‘-lalia’ ~ ‘to speak, to chat’. Scientists who initially studied it in the 60’s and 70’s drew the conclusion that glossolalia was related to psychopathology (that people who spoke in tongues were crazy) [1, 2], and in later decades, it was thought to be caused by a form of temporal lobe epilepsy . I was fascinated to find this research for myself. Dr Leaf never references her social media memes, so I started looking through the medical literature on the subject from respected databases like PubMed, and search engines like Google Scholar. Despite a thorough search, I was only able to find one article that studied the pattern of brain activity during speaking in tongues. The article, “The measurement of regional cerebral blood flow during glossolalia: A preliminary SPECT study”  took five healthy women, psychiatrically stable, long term members of their churches, who had all spoken in tongues for many years. They scanned their brain activity after a period of singing to gospel songs in English and compared it to their brain activity after the same amount of time praying in tongues (while listening to the same music as before). What they found was that the brain was more active in the left superior parietal lobe, while there was a decrease in brain activity in the prefrontal cortices, left caudate nucleus and left temporal pole. There was a trend for an increase in the activity of the right amygdala, but this may have just been chance. 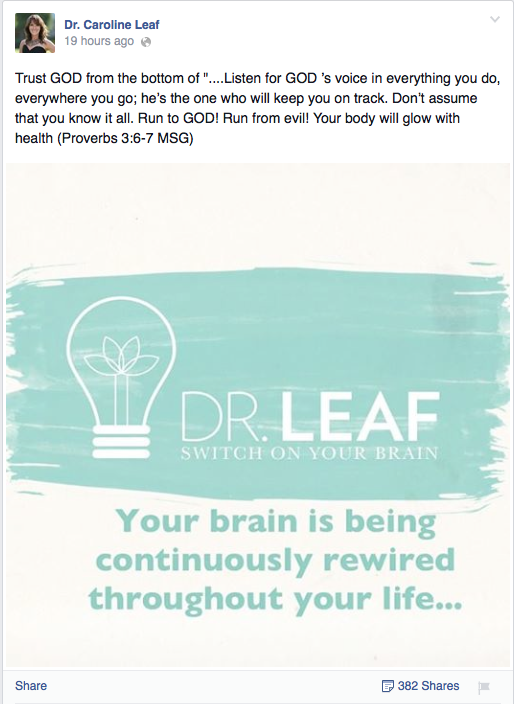 So are any of those brain regions responsible for discernment as Dr Leaf suggested? Well, that all depends on how you define “discernment”. “Discernment” is not really a common neurobiological term. The standard term in the literature is “judgement”. The brain regions that are associated with evaluation and judgement are the amygdala and ventral portions of the striatum as well as the ventromedial prefrontal cortex (vmPFC), orbitofrontal cortex (OFC), the insula, the dorsal anterior cingulate cortex (dACC), and the periaqueductal gray (PAG) . Are there any parts of the brain that match in the two lists? Only one – the ventromedial prefrontal cortex, or vmPFC for short. The prefrontal cortex is important in reasoning and decision-making, especially if there is uncertainty or novelty, while the vmPFC in particular is involved in the use of goal-relevant information in guiding responses, e.g., assigning value to choice options . 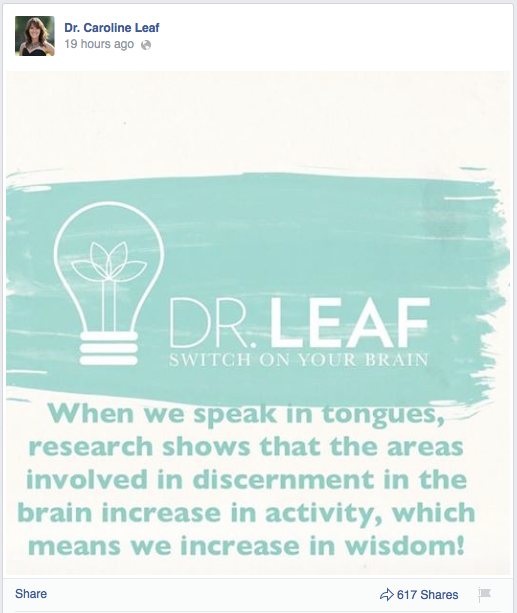 According to Dr Leaf, “When we speak in tongues, research shows that the areas involved in discernment in the brain increase in activity”. But that’s certainly not what the research paper said. The actual research is entirely the opposite. Again, there are really only two reasonable explanations as to why the research contradicts Dr Leaf; either there is another piece of research which supports Dr Leaf’s assertion, or Dr Leaf is simply wrong. At the risk of repeating myself, Dr Leaf needs to quote her sources when she is writing her little social media memes. Her meme may be perfectly justified by robust scientific evidence, but if she isn’t willing to share her sources, we’ll never know, and the only conclusion remaining is that Dr Leaf can’t interpret simple research. So as it stands, there really isn’t any evidence that speaking in tongues makes you more discerning. By trying to claim otherwise, Dr Leaf further undermines her own reputation and credibility as an expert. Doré, B.P., et al., Social cognitive neuroscience: A review of core systems, in APA Handbook of Personality and Social Psychology, Mikulincer, M., et al., (Eds). 2014, American Psychological Association: Washington, DC. p. 693-720. Nicolle, A. and Goel, V., What is the role of ventromedial prefrontal cortex in emotional influences on reason?, in Emotion and Reasoning, Blanchette, I., (Ed). 2013, Psychology Press. So, I can’t find fault on what Dr Leaf said here. It fits with the paper I quoted from Newberg et al (2006). Still, it begs the question of why Dr Leaf couldn’t have said this in the first place, and why she still isn’t willing to share her citations? It also raises the other obvious question, why is it important to know what our brain does in glossolalia? It’s only a study of 5 patients, and I’m sure that not all episodes of speaking in tongues is associated with decreased intentionality. The research, being so small, isn’t a true reflection of the practice of speaking in tongues. Lets hope that the future will bring more funding to better study this central tenet to the charismatic faith. I think I might have to throw away my genetics textbook. I was always taught that genes were the main driver behind health and disease, and I always thought it was a pretty good theory. Taking her statement at face value, she appears to be saying that genes have nothing to do with our health. Dr Leaf has made some asinine statements in the past, but to suggest that genes are irrelevant to human health seemed so stupid that no one in their right mind would suggest such a thing. Perhaps I was taking her statement the wrong way? I wanted to make sure I didn’t jump to any rash conclusions about Dr Leaf’s statement, so I pondered it at length. Could she be referring to ‘control’ in the absolute sense? How much control do genes have on our health? What about the mind? After deliberating for a while, I still came to the conclusion that Dr Leaf’s statement was nonsense. 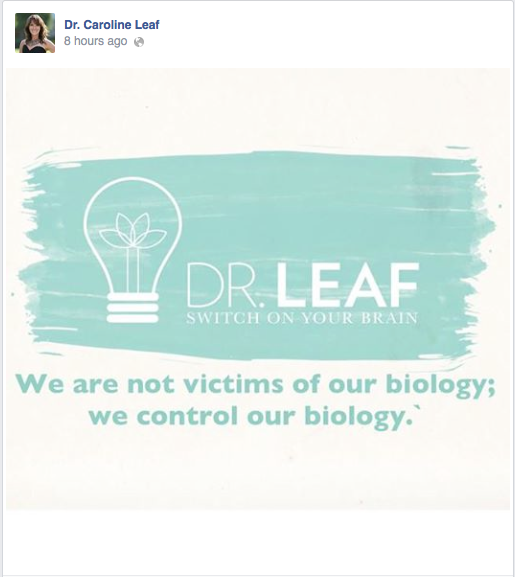 Unfortunately, Dr Leaf’s statement is, like so many of her previous Facebook memes, so vague as to be misleading. The meaning of ‘health’ and ‘controlled’ could be taken so many ways … which part of our health? How much regulation constitutes ‘control’? What about genetics? Looking at her statement in more depth, it becomes clear that no matter which way Dr Leaf meant it, it’s still wrong. For example, all of human health is controlled, in part, by genetics. That’s because life itself is controlled by genetics. The human genome provides a blueprint for the construction of all of the proteins in all of the cells in our entire body. The expression of those genes determines exactly how our body will run. If the genes are wrong, if the translation of the gene code into a protein is wrong, or if too much or too little of a protein is made, all determines whether our body is functioning at its optimum level or not. The stimulus for the expression of our genes is influenced by the environment in which we live. If I go out into the sun a lot, the UV light triggers my skin cells to make the protein melanin, which makes my skin go darker and helps to provide some protection against the damaging effects of the UV light. While the environment plays a part of the expression of some genes, it’s wrong to say that genetics doesn’t control the process. If I go into the sun too much, I risk developing a melanoma, because the sun damages the genes in some of my skin cells, causing them to grow without control. Genes are still responsible for the disease itself. Sometimes the trigger is from the environment, sometimes it’s not. There are some people with genes for melanoma who don’t need an environmental trigger, because they develop melanoma on skin that’s exposed to very little UV light, like the genital skin. So fundamentally, even taking the environment into account, our health is controlled by our genetics. Even if one considers the mind as part of the sub classification of “a behavior pattern”, it’s still pretty clear that most of the factors that make up our environment are not related to our mind at all but are related to the external world, of which we have minimal or no control over. Sure, we make choices, but our choices aren’t truly free. They’re constrained by the environment in which we find ourselves. In the same way, our mind may have some tiny influence on our health, but only insofar as our environment and our genes will allow. When it all boils down, this meme of Dr Leaf’s is rested on her foundational presumption that our mind can control matter, a very strong theme throughout her most recent book , but which is still preposterous. Our thoughts are simply a function of our brain, which is in turn determined by the function of our nerve cells, which is in turn a function of our genes and their expression. Our mind doesn’t control matter. Matter controls our mind. I can keep my genetics textbooks after all. Unfortunately for Dr Caroline Leaf, communication pathologist and self-titled cognitive neuroscientist, grandstanding does not equate to authority. It’s all very well and good to publish broad, sweeping generalisations, but it’s like firing a shotgun at a cork from thirty paces. Sure, you might hit your target, but the scatter pattern of the ammunition misses more times than it hits. If Dr Leaf wants her statement to be taken seriously, then she needs to do a couple of small things. (1) Reference her statement. This should be fairly easy if “researchers around the world” really have demonstrated the power of mind training. To sum it up more effectively, perhaps Dr Leaf could cite a meta-analysis that proves the value of mind training. (2) Stop confusing the mind with the brain. This is the biggest problem with her statement. The mind does not control the brain. 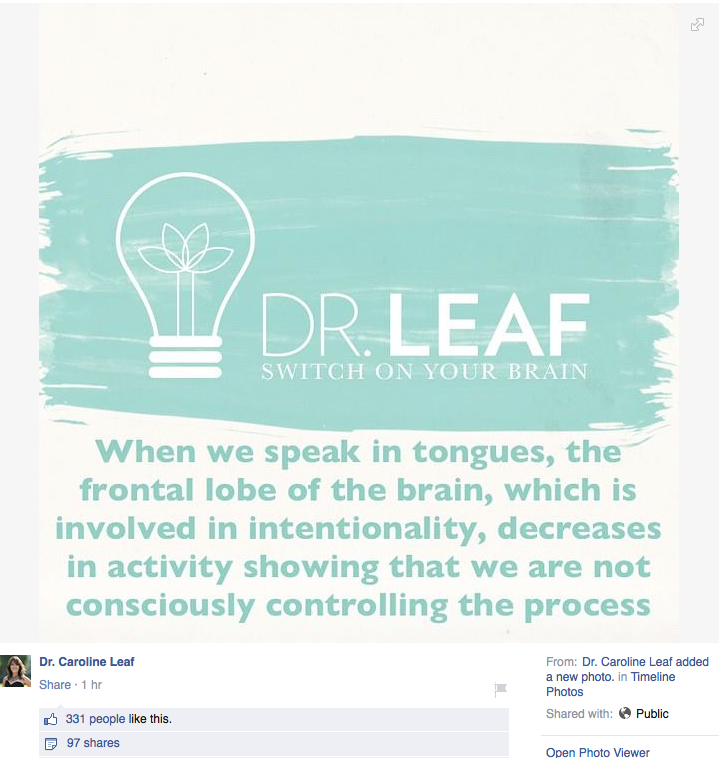 If Dr Leaf produced any references in support of her statement, they would be along the lines of training or retraining the brain, not the mind. It may seem trivial, because most people think the mind and the brain are the same, but they’re two distinct things. Old psychological therapies were based upon the notion that fixing your thoughts was the key to improving your mental health, but this notion is now outdated, considered part of “Western folk psychology” . 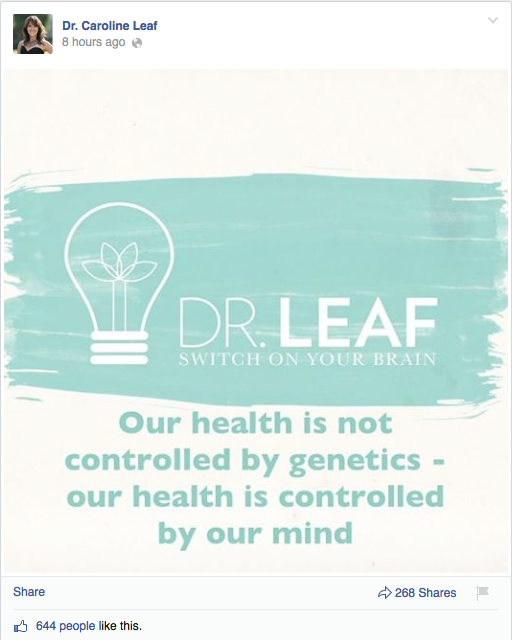 By using the concept of “mind” and “brain” interchangeably, Dr Leaf confuses the issue for the average person trying to come to grips with modern science. I’d be grateful if Dr Leaf could publish some evidence to support her claim, because I’m unfamiliar with research showing that things like intelligence can be improved with brain training. Sure, there’s good evidence for the improvement in the damaged brain with specific physical exercises – it’s one of the primary tools in Rehabilitation Medicine. There is also good evidence for psychological therapies such as ACT, or Acceptance and Commitment Therapy, in improving mood amongst other things [2, 3]. Though I’ve read a recent meta-analysis of multiple studies that suggests “brain training” for working memory offers minimal benefit which is not maintained and not transferable across categories , which means there’s no proof that “brain training” improves intelligence. In future posts, I hope that Dr Leaf provides something more accurate instead of grandiose shotgun statements. Herbert, J.D. and Forman, E.M., The Evolution of Cognitive Behavior Therapy: The Rise of Psychological Acceptance and Mindfulness, in Acceptance and Mindfulness in Cognitive Behavior Therapy. 2011, John Wiley & Sons, Inc. p. 1-25. Dr Leaf is a communication pathologist, and a self-titled cognitive neuroscientist. 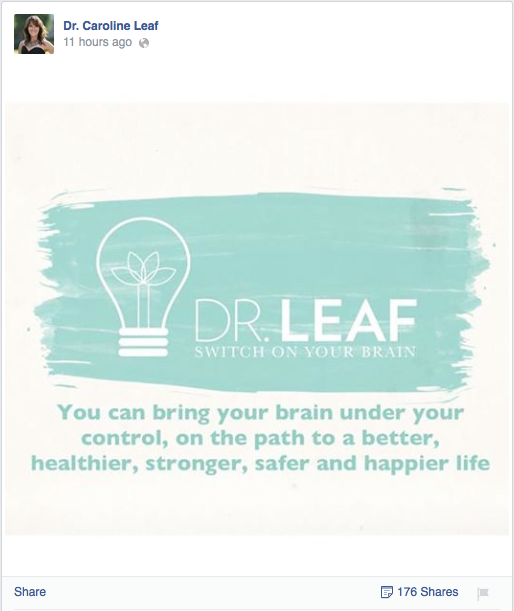 Yesterday, Dr Leaf made a couple of carefully worded statements on her social media feeds, which given the quality of her previous couple of neuroscience-based factoids, is a definite improvement. First, she said that, “Your brain is being continuously rewired throughout your life …”. Yep, I can’t disagree with that one. The brain is a very dynamic tissue, constantly remodelling the synaptic wiring to process the information it receives on a daily basis. That’s why the brain is referred to as ‘plastic’, reflecting the property of plastic to be moulded into any shape. Her next offering sounds really good too. It’s full of encouragement, positivity and hope … the classic feel-good quote: “You can bring your brain under your control, on the path to a better, healthier, stronger, safer and happier life.” Whether it’s true or not depends on how literally you interpret it. If you loosely interpret it, then it sounds ok. Sure, we have some control over how we act, and if we live our life in the direction dictated by our values, then we will have a better, healthier, stronger, safer and happier life. Modern psychological theory and therapies confirm this . However, what Dr Leaf actually said was, “You can bring your brain under your control”. Having some control over our actions is entirely different to bringing our brain under our control. We can control some of our actions, but we don’t control our brain any more than we ‘control’ our car. When we say that we’re ‘controlling’ the car, what we actually mean is that we are controlling the speed and direction of the car. But there are thousands of electrical and mechanical actions that take place each second that are vital for the running of the car, and that we have absolutely no direct control over. It just takes one loose nut or faulty fuse to make the car steer wildly out of control, or stop functioning entirely, and then we’re not in control at all. In the same way, various diseases or lesions in the brain show that brain is really in control, tic disorders for example. These can range from simple motor tics (sudden involuntary movements) to complex tic disorders, such as Tourette’s (best known for the involuntary tendencies to utter obscenities). Another common example are parasomnias – a group of disorders in which people perform complex behaviours during their sleep – sleep talking, sleep walking, or sleep eating. The fact we don’t see all of the underlying processes in a fully functional brain simply provides the illusion of control. Our brain is driving, our stream of thought just steers it a little, but it doesn’t take much to upset that veneer of control we think we possess. Ultimately, our brain is still responsible for our action. We don’t have a separate soul that is able to control our brain. Any decisions that we make are the result of our brain deciding on the most appropriate course of action and enacting it  (and see also ‘Dr Caroline Leaf, Dualism, and the Triune Being Hypothesis‘ for a more in-depth discussion on the subject of dualism). Therefore, we can’t ever bring our brain under control. This is important because if we believe that we can bring our brain under control, then by simple logical extension, we can control everything our brain is responsible for – our emotions, our feelings, our thoughts, our memory, and every single action we make. 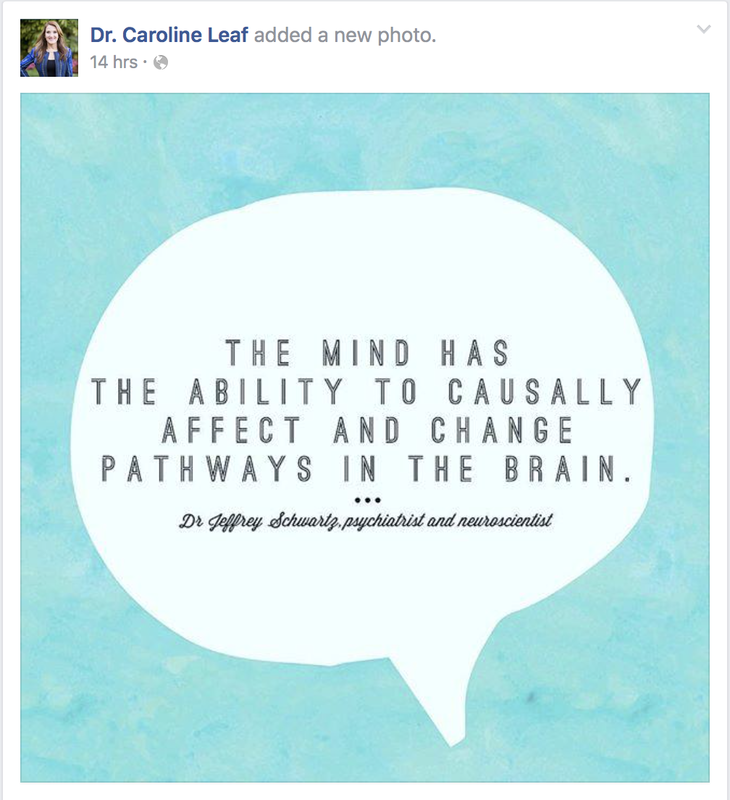 This is Dr Leaf’s ultimate guiding philosophy, though it’s not how our neurobiology works. If we were to believe that we control our thoughts and feelings, we set up an unwinnable struggle against our very nature, like trying to fight the tides. We are not in control of all our thoughts, feelings, emotions or all of our actions, and neither do we have to be. We just need to make room for our uncomfortable emotions, feelings and thoughts, and to move in the direction of those things we value. So if you were to take Dr Leaf at her word, she still missed the mark with her post. It sounds ok in a very general sense, but closer inspection reveals a subtle but significant error. Giving credit where credit’s due, Dr Leaf has tried to tighten up her social media statements. It’s commendable, but unfortunately she needs to bring her underlying philosophy closer to the accepted scientific position to further improve the quality of her teaching.